Yup, Grave Encounters is found footage. Yup - night vision scenes. Yup - people loose it and yell at each other. Cameras shake. Ghost mouths open super wide with computer graphics. But, it's all highly entertaining. Colin Minihan and Stuart Ortiz (as The Vicious Brothers) really know how to keep a film buzzing along. The concept is ultra conventional and simple - a paranormal investigator show's footage is found after they all go missing or are dead. Standard. However, I just watched another found footage film that I won't name here ("If you don't have anything good to say, don't say anything at all.") and that thing was a total and complete hipster bore! To echo R. Ebert, it was a 12 minute short crammed into 101 minutes. 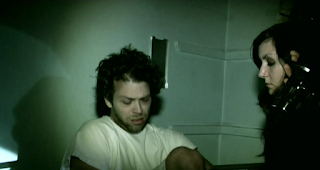 However, GRAVE ENCOUNTERS keeps shaking things up and adding little nuggets to keep things interesting and new. We have the usual setup where they are going to be locked in until someone lets them out. They did the same in 21 Days in 2014. They look around and don't really find anything. Things start to get a little slow, then we - the audience - starts to see things on the cameras they have set up. When that gets old, the crew starts to experience things themselves. Then, things continue to fly off the rails for them in horrid ways. It's a fun watch and it has a lot of cool little set pieces. It was made in 2011 and I believe it was at the forefront of the computer graphics HUGE OPEN MOUTH gimmick that numerous movies drove into the ground. I want to say that these folks did it first. It's odd. I thought THE VICIOUS BROTHERS had more under their belts. I'm only seeing GRAVE ENCOUNTERS 1 and 2, EXTRATERRESTRIAL, and IT STAINS THE SANDS RED (2017) in their credits. I definitely want to check out SANDS - I've heard some good buzz about it. At any rate, if you want some fun, amusement park haunted house-like scares for a dark night, this will provide many a good BOO! for your amusement.